På svenska, tack Errors in timestamp? 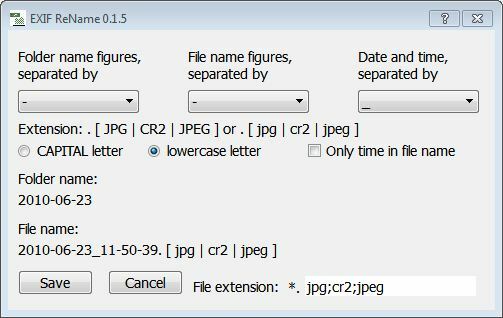 Select the format of folder and file name. 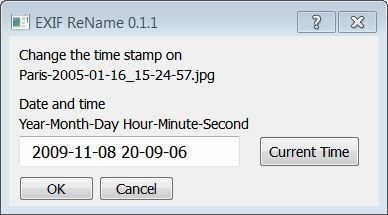 It is possible to change the EXIF data in image file. The program works with Linux, Windows and MacOS X. The program is written in C + + and uses Qt4 graphic library. There is a setup program for Slackware GNU / Linux, Ubuntu (Debian) and Windows. Tested on Slackware 11, 12, 12.1, 12.2, 13.0, 13.1, 3.37, 14.0, 14.1 and 14.2. Ubuntu 7.10, 9.04 and 9.10 and on Windows XP, Windows Vista, Windows 7, Windows 8 and Windows 10. Specify which file extensions that you want the program to find. Separate them with ";" (semicolon). Many thanks to Roberto Nerozzi for the Italien translation. Many thanks to Cristian Sosa Noe for the Spanish translation. Many thanks to Ben Weis for the German translation. 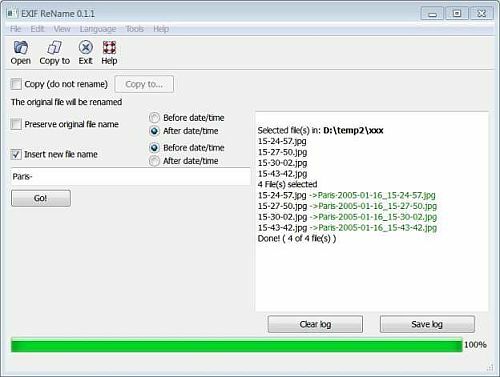 EXIF ReName creates folders and copies your pictures to correct folder. You find old versions including source code and tools for development, compilation and translation. EXIF ReName Translation Help needed! It is very easy for everyone to translate EXIF ReName! You download the language files (English), and translate the string between <source> and </source>. Enter the translation between <translation> and </translation>. It becomes even easier if you use Qt Linguist, you will find a link to the program below. 2 nd Improved translation for all translated languages. 1 st The Russian language flag is hopefully visible at all installations. 2 nd Automatic restart when changing languages. Always check the hash sum if you download my software from a website I do not control. Then you know that the program is genuine.